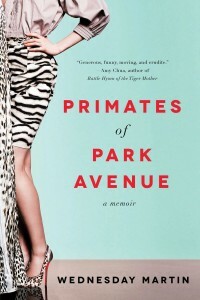 Primates of Park Avenue has been getting a lot of press as an ethnography of New York’s Upper East Side mothers, and is being promoted as revealing the shocking fact that these women receive not just regular allowances from their superrich husbands, but are also gifted with end-of-year bonuses. That they are status-conscious, dependent, anxious, heavy drinkers who exercise constantly and starve themselves into well-muscled skeletons is not considered newsworthy enough to sell books, though these familiar observations make up the bulk of the book. Most of the social science that is scattered about the book is not sociology, for which our discipline should be thankful.Most of the social science that is scattered about Primates of Park Avenue is not sociology, for which our discipline should be thankful. Instead, Martin manages to give anthropology a black eye. Although sensitive ethnographies of the wealthy elite of the current Platinum Age have been done (most notably by Shamus Khan in Privilege), and one might expect Martin’s status as a participant-observer to generate insight and sympathy, neither is on display. Indeed, the mix of anthropology and clinical psychology on which Martin draws provides much less insight into the women she purports to study than into herself. Her PhD was in cultural studies and apparently focused on Bronisław Malinowski; her reading of anthropology is from the outside, as an avid consumer of the exotic, in the worst tradition of National Geographic. At the outset, Martin is eager to present herself as a stranger to the culture of the Upper East Side who is being initiated into its peculiar rites, even though her radical move was a trek from the West Village to live closer to her superrich in-laws who help get her kids into hyper-competitive preschool. In her new milieu, Martin exoticizes the setting and its inhabitants with faux-anthropology jargon, such as calling new mothers “primiparas,” schools “learning huts,” real estate agents “dwelling shamans,” and apartment buildings “vertical dwellings.” Every person who gives her advice, whether her sister-in-law or her buyer’s agent, is framed as a native informant. The startling lack of insight into herself as one of the tribe of highly educated, underemployed, and wealthy mothers is revealed in how Martin repeatedly casts herself as female primate transferred to another troupe (one in which loners, outsiders, and pariahs are at risk of death—these are the jungles of New York, after all). Martin goes so far as to claim culture shock as the cause of her disquiet in embracing the competitive ethos as enthusiastically as she does. She presents “going native” with the full-chapter analysis of her purchase of a $10,000 handbag, admitting in passing that her husband was not surprised because he had known for at least a decade that she was fixated on this particular luxury brand. By the end of the book, when she has experienced the sympathy and shared grief of other Upper East Side mothers for her pregnancy loss at six months, she confesses that she finds real human beings under the women’s cultivated airs of superiority and indifference she had mocked in the early chapters. Ironically, superiority and indifference better describe her own tone in the first half of the book. In the happy ending, Martin discovers she fits in after all. The book has more of the structure of a Bildungsroman than a true ethnography. A more accurate subtitle, “How I became shallow, self-absorbed, and aggressively competitive without letting it bother me anymore,” might not sell books, but the absence of self-reflexivity is glaring. Self-absorption is not the same as reflexivity and this book is a ideal for helping novice ethnographers see the distinction. The anthropology is not only introduced to underline her difference from this tribe of women, but to decorate the story with socio-biological claims about how what the women do is what every female primate must. Since that forecloses any effort to see the distinctiveness of the culture, the behaviors observed are never interpreted in light of meanings extracted from that culture, but slotted into pre-made categories like potlatch or grooming behaviors. Had Martin done real ethnography in this unusual culture, rather than dressing up her own story with superficial references to primates and primitive tribes, we would have had more questions posed to the women about what their behavior meant to them and more curiosity about the things that seem invisible to them (like the nature of the omnipresent “staff” and their views of the city and neighborhood). Had Martin combined curiosity with reflexivity, as good ethnographers do, we might even have found some insight into the decision-making processes that lead professional women (such as herself) to forsake their own careers and move into this particular form of acutely competitive display of privilege. Her empty comparisons to “tribes” and animals distract Martin from considering variation that might illuminate the particular choices and distinctive experiences of these Upper East Side women. She presents other metro NYC neighborhoods as if they were terra incognita (a view she attributes to the “natives”), but clearly these wealthy families have choices about living extravagantly in other parts of the city, let alone in some of its gilded suburbs, where the demands for status display are different, though perhaps no less acute. Who does and doesn’t move into the Upper East Side? If the Upper West Side is “more relaxed,” why does she (and her “tribe”) really choose the particularly anxiety-rich competitions of the East Side? How do women come to covet enough hyper-expensive handbags to fill a closet (like hers)? How do they become blind to the humanity of the people who wait on them (as she is)? How do they manage to divide Manhattan in a way that erases economic inequality and racial diversity (as her map does)?A more accurate subtitle, “How I became shallow, self-absorbed, and aggressively competitive without letting it bother me anymore,” might not sell books, but the absence of self-reflexivity is glaring. In fact, the flaws in Martin’s account make it a relatively ideal negative from which to view ethnography for the social science that it is, whether it is practiced by methodologically well-trained anthropologists, sociologists, or others. There is a discipline to ask the clearly awkward questions and accept embarrassment as the price, to cultivate one’s curiosity about the self-evident by asking how else it really could be, to seek out the cases that contrast with rather than conform to the norm, to empathize from the outset with people who are socially othered and try to see how their behavior makes sense to them. We can learn as much from a close observation of the presumably White (their race is never mentioned), socially vicious, and hyperrich, I am sure, as we do from every foray into extreme poverty and the lives of young gang members. In this book, we don’t. 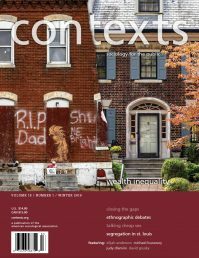 Consider how serious ethnographic investigation might bring to light racial dynamics by looking at interactions among those who are merely rich, mega rich, shopkeepers, and household staff, interrogating hyper-segregated lives as a specific choice. It could bring out the particularity of gender performances by looking at the handful of superrich women who are themselves the hedge fund managers or the inheritors of businesses and comparing their lives, work, and marital relationships with those of the dependent wives. It could consider the previous marriages and residences of these women as a way of getting at what they value, in addition to where and how they choose to live now. Surely, if the differences between East and West Side cultures are even close to as stark as Martin claims, there would be much gained in looking at what people want and miss when they move. Bookshelves are already well stocked with a number of excellent ethnographies of wealthy professional women managing their competing devotions to jobs and families. I opened this book hoping to learn something useful about how highly educated women who leave paid work also manage or struggle with their self-care, child-care, desire for status, loss of income, intensive mothering-by-proxy, and required support for their husbands’ careers. A real ethnographer still has the opportunity to write that potentially important book, if only they could gain the type of access to this population that Martin has squandered. Myra Marx Ferree is in the department of sociology and the department of women and gender studies at the University of Wisconsin-Madison. She is the author, most recently, of Gender: Ideas, interactions, Institutions, with Lisa Wade.